Well now we’re going to give you step-by-step on how to make 7 of the most popular kinds of hot sauce out there. There’s nothing quite like rolling up your sleeves and making your own fresh, delicious hot sauce right from the comfort of your own kitchen! Before we begin, let me start by pointing out there are two different ways to make hot sauce. The first is to prepare the ingredients, cook them, blend them, and then put them in a bottle. The second way is to chop your chilies and then age them… often in oak barrels. This is how the world famous Tabasco Brand hot sauce is made. The aging process allows the chilies to ferment and extract flavors from the barrel (like a fine wine). Just because a hot sauce is cooked or fermented doesn’t make it better or worse. There are great cooked hot sauces… and there are great fermented hot sauces. It really just depends on you and which ones you like better. That may take a little bit of taste-testing… never a bad thing! Louisiana hot sauce is one of the simplest types to make. Why? Because it’s made from only three ingredients! These hot sauces are often fermented… but you can make a quick cooked version as well. The most popular version of Louisiana hot sauce is made with Tabasco peppers. But you can really use any type of hot pepper you want! Simmer for 10 minutes – until the chilies are soft. Because of the vinegar, this hot sauce will keep for months. Thai Hot sauce is also called Nam Phrik. There are thousands of variations of Thai hot sauce, many having an amazing mixture of additional ingredients. The popularity of this hot sauce stems from the fact that in Thailand, it’s often used as both an ingredient and a condiment in cooking. Thai hot sauce is identified from the inclusion of fish Sauce, garlic, and sugar to give it a level of sweetness and flavor depth. The fish sauce is salty, so use sparingly. Add additional vinegar to get the perfect consistency / taste. Refrigerate this hot sauce. Because of the vinegar, this hot sauce will keep for months. Mexican hot sauce is differentiated from other sauces by the use of dried (and sometimes smoked) chili peppers. The hot sauce also includes the addition of onions, tomatoes, oregano, and cumin to round out the flavor. ● Add all the ingredients to a pan over medium high heat. ● Simmer for 10 minutes – until the chilies are soft. ● Let the mixture cool to room temperature, then blend till smooth. ● Add additional vinegar to get the perfect consistency / taste. ● Strain the mixture and bottle. Refrigerate this hot sauce, use within a few days. 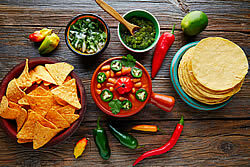 Caribbean hot sauce is identified by two main factors, the use of very spicy peppers, and the inclusion of sweet fruit like mangos or peaches. 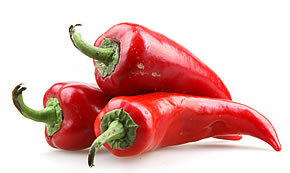 Classic Caribbean hot sauces often use scotch bonnet peppers, a very hot pepper- so use sparingly. 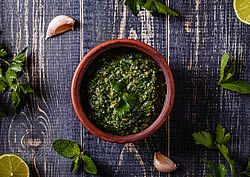 Salsa Verde, or green salsa is another hot sauce from Mexico. The sauce is made with green jalapenos, tomatoes, onion, and tomatillos. Often these items are roasted over an open fire, giving the salsa a roasted, smoky flavor. Rounding out the ingredient list are garlic, and a bunch of Cilantro giving the salsa an herb flavor. Cut Tomatillos and Onion into quarters. Roast the Tomatillos, Onion and Chilies over open fire, until nicely charred. This recipe is for a quick chili sauce which can be used almost anywhere. The Worcestershire sauce adds another level of flavor and taste. Rough chop all the ingredients and blend thoroughly. Boil for 20 minutes stirring constantly. Let the mixture cool to room temperature, and bottle. 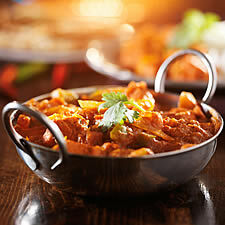 Vindaloo Hot Sauce comes from India and is characterized by it’s incredible mixture of spices that add a depth of flavor and heat that everyone loves! Heat the oil in a big pot over medium. Add all the spices and saute until fragrant – about 10 minutes. (This is an important step as it adds an incredible depth of flavor). Rough chop all the remaining ingredients and add to pot. The sauce should reach a thick consistency. Let the mixture cool to room temperature, then blend thoroughly. Ok so there you have it. 7 simple recipes to make some of the most well-known hot sauces in the world. Once you get the hang of the basics, it’s fun and easy to add different ingredients to see if you can come up with something completely unique! But if you want to skip all the work and are just looking for a great pre-made hot sauce, be sure to check out our list of the best hot sauce right here. About the Author: Hi I'm Elizabeth Adams, Chief Editor here at HotSauces.com. As you're probably guessed by now, I love all things hot sauce related. 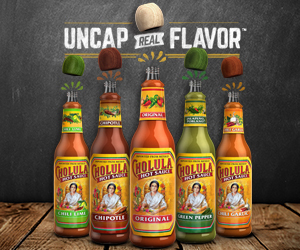 I put it on EVERYTHING and love trying out new hot sauces-- especially new and unique ones.